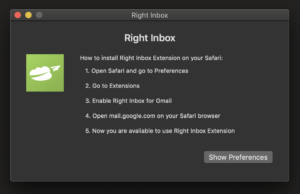 Click here to download Right Inbox browser extension for Safari, if it hasn’t started automatically. Alternatively, you may install the extension directly from App Store. Are you looking for Mozilla Firefox or Google Chrome? Once you click install you will see the Safari App Extension with the guidelines.